I know school has overtaken my blog lately, but this is my last Back to School project for the year. This one is a tag I put on a gift bag for my new teammate. I used the Papertrey Ink Shaker Shapes: Pencil Die to make my shaker, and adhered it to a simple rectangle base, made with one of the My Creative Time Stitched Rectangular Frame Dies. The sentiment is from MCT's My Teacher Rocks. So fun! Papertrey Ink came out with this really fun Paper Pencils Adhesive Label Pad a few months ago, and I knew it would be perfect for making personalized pencils for my students for the first day of school! 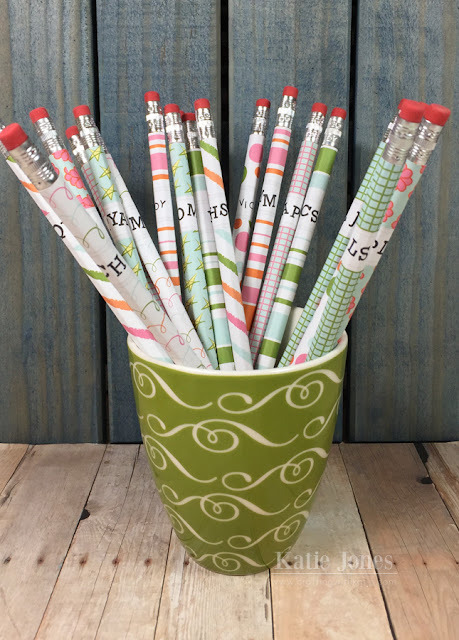 They are just decorative labels that wrap around a regular pencil, and there is a spot near the top for stamping something. For most kids, I stamped their initials with the PTI Pencilgrams Mini Stamp Set. I had started to try stamping out their full names with the PTI Simple Alphabet set, but I found it tricky to line up the letters. 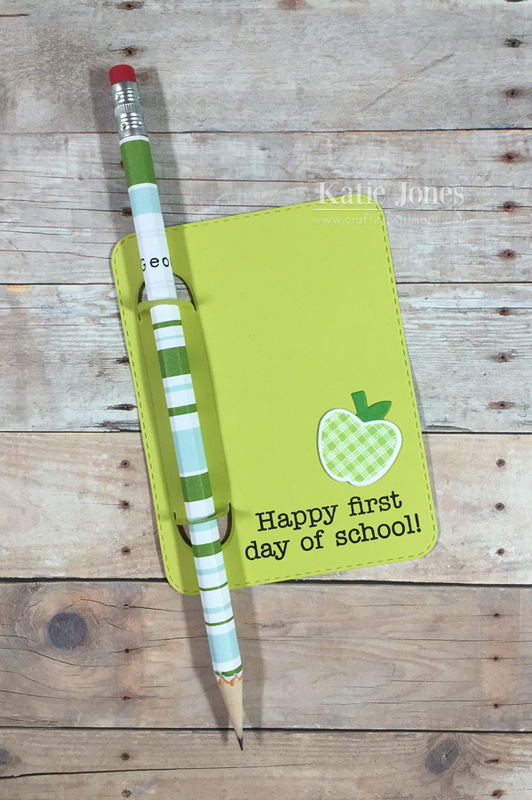 I made the card using the My Creative Time Stitched Journal Card and punched the holes for the pencil with the PTI Write Stuff Holders Die. 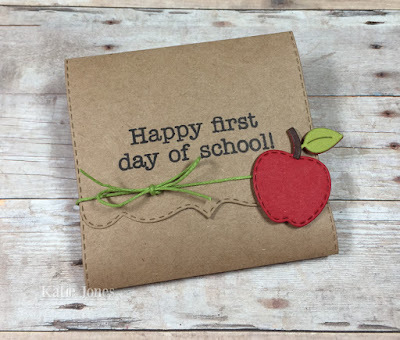 Then I added a little apple made with PTI's Back to School stamps and dies and a sentiment from MCT's Write On. It's "Do Over" Thursday with My Creative Time, a day when we choose a card that we made in the past, one that we maybe aren't happy with or would like to switch up the theme, and we remake it! I chose my card below. I like the design of it, but I was never really happy with how my background turned out. 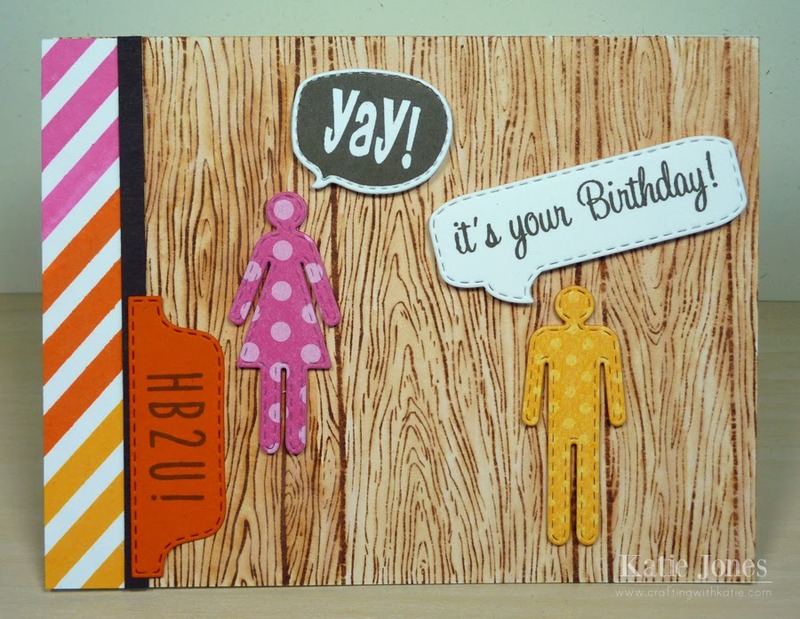 I used a watercolor over the woodgrain background stamp, and I just don't think the color works well with the rest of the colors in the card. For my new card, I kept a white background. I took a strip of white paper and stamped the Geo Borders on it with some Hero Arts inks and then adhered that to a strip of black cardstock before adhering it to my white card base. I die cut my Stitched Restroom Peeps out of blue and green patterned paper this time, and then used the same blue and green Hero Arts Inks that I used on my border to ink up the speech bubbles, made with Stitched Square Speech Bubbles and Fun Speech Bubbles. 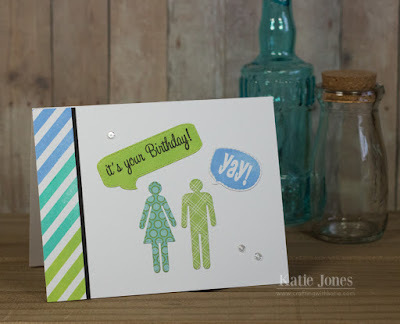 The "square" one was stamped with a sentiment from Celebrate Good Times and the "Yay!" 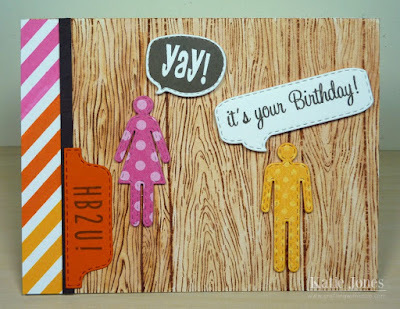 stamp is included in Fun Speech Bubbles. Lastly, I added a few Pretty Pink Posh Sequins. Be sure to stop by Emma's blog to see some more "Do-Over" projects! It's What a Treat Wednesday with My Creative Time, and I have a quick and easy treat to share with you today! Okay, here was the scenario. It was Sunday night at 7 PM. I was absolutely exhausted after working in my classroom for the last three days straight, but it was finally ready for my new students to enter the next morning. 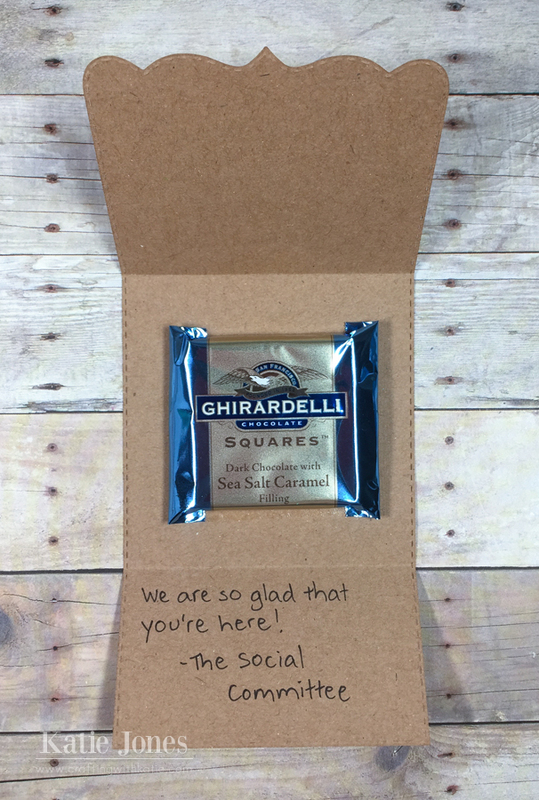 However, as the Social Committee chair for our staff, I really wanted to make a little something for all of our new staff members (and we have a LOT of them). My Creative Time to the rescue! I pulled out the Fancy Trifold Card Die and cut 12 of these. Then I used the apple die from Love to Learn and quickly put together a dozen cute little apples. On each card I stamped my sentiment, from Write On, wrote a little note in the inside, and then adhered a Ghirardelli chocolate with some double-sided tape. I closed it up, tied it with some hemp, and then adhered the apple with some foam tape. Finished. All 12 in 1 1/2 hours! Probably could have been faster if I hadn't been so tired!